For the last few months staff in Archives & Special Collections have been working on a project to learn more about former Bangor University Students and Staff who died during the First World War. The aim of the project was to identify all ninety seven men listed on the War Memorial Plaques located outside the Pritchard Jones Hall to put faces and stories to the names. Our hope was to find out who these men were, where they came from, who they served with and how they died. The research proved challenging and required us to really dig deep into the Archives and Library resources to identify and piece together the lives of the individuals. Student Registers were the first resources we used to match up the names from the plaques. Only initials and surnames are given on the memorials which meant we had to search through thousands of names in the registers to make sure we had the right people - in some cases identification proved impossible because some of the names were so common and we had very little information available. In addition to this, we searched through other University records (Committee records, Student Handbooks, Gazettes, Student photographs, Staff records, etc.) and local newspapers from the period to find out further personal details. Military databases were used to research military careers and websites containing local War Memorial information helped in completing the research. In undertaking this research we also identified men whose names were not included on the plaque – we intend to research these individuals and eventually include them in the project. We also intend to look into the stories of the Students and Staff of the Normal College who enlisted and lost their lives during the war. We are still piecing together the stories of the fallen and ask anyone who has any information about them to get in touch. John Alexander Baxter was born in Essex on the 30th August 1893. The Baxter family later resided in 'Eastholme,' Llanfairfechan, and afterwards Bryn Gwylan, Conwy. He was a pupil at the National School and winning a scholarship entered Friars School in Bangor. He entered the University College of North Wales in 1910 where he took up an agricultural course, graduating with a BSc in 1914. He had become Major of the 12th Royal Welsh Fusiliers, having worked his way up through the ranks of 2nd Lieutenant and Captain, and was awarded the Military Cross. He was killed in action in June 1918. John Edwin Bayliss, born in Rhyl on the 17th March 1892, was the son of John Francis Bayliss, Accountant and Deputy Town Clerk to Rhyl Urban District Council, and Amy, daughter of the late Edwin Davis of Bristol. He was educated at Clwyd Street Church of England School and then the University College of North Wales where he obtained a First Class Honours in his BSc Degree in Chemistry. After obtaining the Dean Edward’s prize in 1914 he secured a University studentship. A year later he obtained the post of chemist in the Nobel Explosives factory in Ardeer, Scotland. He obtained a commission as 2nd Lieutenant in October 1914, promoted to Lieutenant in August 1915, Captain in November 1916 and then Major in March 1917. After undergoing training in Ireland he served with the Expeditionary Force in France and Flanders, taking part in the Battle of Loos. 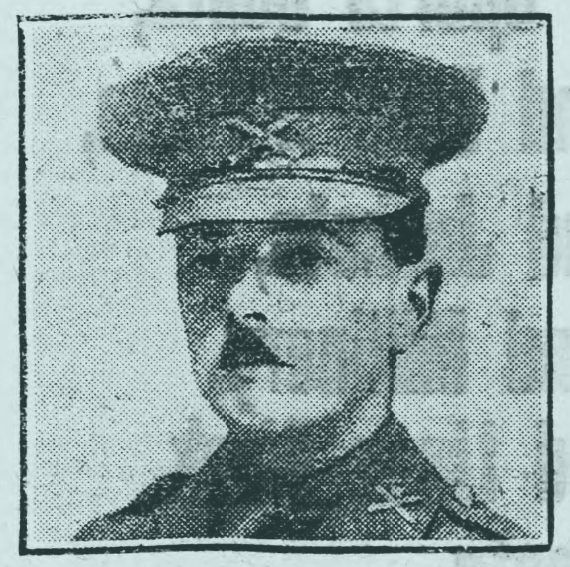 He was mentioned in Despatches by General Sir Douglas Haig [London Gazette, 18 May 1917] and was awarded the Military Cross for conspicuous gallantry and devotion to duty, in continuing to register for some hours the guns of his battery from an exposed position where he was subjected to very heavy shell fire. He was wounded at Ypres on 29 September 1917 and died at No. 61 Casualty Clearing station the same day. Isaac Gwilym Bevers was born in 1893 in Henley-on-Thames, Oxfordshire, to Walter and Margaret Bevers, later moving to Harlech, North Wales. He had a distinguished scholastic career, gaining the premier position in the Merionethshire county examination, he entered Barmouth County School, and was awarded a scholarship admitting him to the University College of North Wales in 1911. He graduated in 1914 with a BSC with honours in Chemistry. He joined the army the same year, seeing service in Gallipoli as 2nd Lieutenant in the 16th Royal Welsh Fusiliers. He was engaged to Miss Gracie Thomas, daughter of Mr W. Thomas, 298 High Street, Bangor, and arrangements had been made for the wedding. 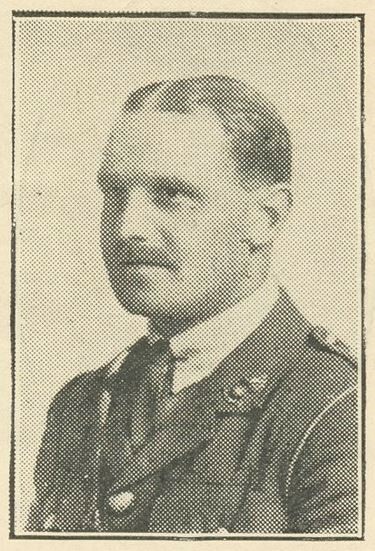 Lieutenant Bevers died of his wounds in France on the 2nd August 1917, the day before he was meant to commence his leave. Herbert Leslie Brock, born on the 26th August 1890, was the eldest son of William, an Elementary School Head Teacher, and Alice Brock, Sunnyside, Tregarth. He entered the University College of North Wales in 1908 and remained until he obtained his BA degree. 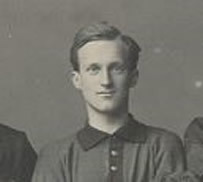 He was well known in athletic circles, being a leading member of the University football team of which he was captain. He was afterwards on the staff at the Elmfield College, York. In February 1915, he joined the Royal Welsh Fusiliers. Soon after he was gazetted for a commission and saw service in France where he was wounded in a daring raid on the enemy trenches on the 13th June, 1916. After recovering from his wounds he was transferred to the Machine Gun Corps and was promoted to Lieutenant. He was killed in action on the 10th April 1918, at the age of 28. George Gamble Burgess was born on the 10th January 1891 in the Parish of St. Margarettes, Leicestershire. He entered the University College of North Wales in 1909 and obtained his BSc in 1913, after which he became a schoolteacher. He enlisted as a Sergeant with the 2nd North Midland Field Ambulance unit of the Royal Army Medical Corps in February 1915. He died of endocarditis in a military ward at the Royal Sussex County Hospital on the 28th November 1917. Roger Norman Cartwright was born on the 24th June 1886 at Glan Aber, Llanasa to Charles Cartwright, a veterinary surgeon, and Marian Elizabeth Cartwright. He entered the University in 1905 and upon leaving, took up position as a Land Agent in Merionethshire. He later moved to Blaine, Montana, USA. He was killed in action on the 18th July 1918 whilst serving with the United States Army (23rd Infantry Regiment, 2nd Infantry Division). Caesar Alfred Cooil was born in 1891 to Caesar and Elizabeth Cooil, 2 Orme View, Euston Road, Bangor. He was educated at St. Paul’s and Friars School, and entered the University in 1910, graduating with a 2nd Class Honours degree in History in July 1915. He took up the position of Assistant at King Edward’s School, Nottingham, before joining the Midland Royal Garrison Artillery Heavy Battery, first as 2nd Lieutenant and later Captain. He died on the 11th November, 1918, at the Bangor Military Hospital from pneumonia aggravated by the effects of gas poisoning. His genial personality and manly character endeared him to a large circle of friends, and this was shown by the large assemblage of mourners at the funeral. The roadway from Orme View to the cemetery was lined by a respectful crowd. Cooil’s name is also listed on the Bangor Railway Institute Boys’ Corps. Memorial, located in St. David’s Church, Bangor. Ernest Arnold Lovell Cook was born on the 27th April 1892 to Frederick Nathaniel Cook and Ellie Pearson Lovell Cook of “Greystones,” Roundhay, Leeds. He entered the University in 1913 and soon gained a Diploma in Forestry. He joined the 122nd Brigade of the Royal Field Artillery, climbing the ranks from 2nd Lieutenant to Major. He was awarded the Military Cross for conspicuous gallantry and devotion to duty on several occasions. He showed exceptional fearlessness and energy when acting as forward observation officer, continually sending back valuable information under fire, remaining out in the open during a heavy hostile barrage at night, and signalling by lamp to headquarters. He also went through heavy hostile fire to rescue some of his men who had been gassed and wounded, and got three of them back safely. His gallantry has been particularly noticeable at all times when assisting his battery when in action. He was killed in action in France on the 1st November 1918. Thomas Frederick Cromar was born in Bangor on the 7th March 1885 to William and Alice Cromar. He was educated at Wrexham County School and entered the University College of North Wales in 1904 to study Chemistry. He was the Science Master at the Wesleyan High School, Oxford, before enlisting with the Pioneer Battalion, the Royal Engineers. He was wounded during battle in France and died of his wounds on the 10th May 1917, his body being buried at the Grevillers British Cemetery in Nord-Pas-de-Calais. John Daniel was born in Caernarfon on the 9th June 1889 to John, a shoemaker, and Catherine his wife. 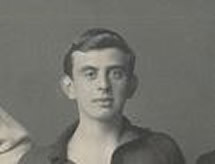 Little is known about his life, only that he entered the University College of North Wales in 1909 and was a valued member of the University Football Team during the 1910-11 academic year. He enlisted with the North Wales Battalion of the Royal Welsh Fusiliers and died in 1922 due to the effects of Gas poisoning sustained the war. David Claude Graham Davies was born in Llanrwst on the 21st December 1891, the son of Thomas John and Annie Louisa Davies, of Awelon, 15, Holbrook Avenue, Rugby, Warwickshire. He entered the University College of North Wales in 1908 where he was a cadet with the University Officers’ Training Corp and a member of the Football Team. Whilst studying at the University he resided at Harcourt Road, Llandudno. In 1910 was in the employ of British Thomson-Houston (BTH), a British engineering and heavy industrial company, based at Rugby, as an Electrical Engineer. He enlisted with the Royal Garrison Artillery (1st Siege Bty. 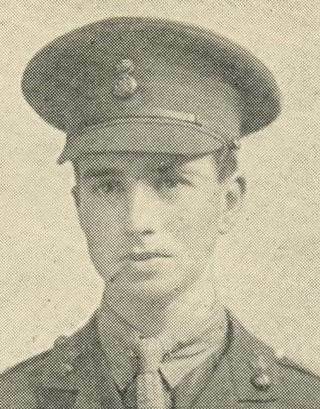 ), and was 2nd Lieutenant when he died of his wounds sustained in battle in France on the 15th May 1915. He is buried at Bethune Town Cemetery, Pas de Calais, France. David Oswald Davies was born in 1869 in Llanfyllin. After obtaining his degree of B.A. at the University College of North Wales he started his career as a Master in a Grammar School. After a period he qualified as a Solicitor and came to live at Barmouth where he established an extensive practice which covered the entire County of Merioneth. In his youth Davies played football for Wales in the International, and took a great interest in the local team at Barmouth. He fulfilled many positions of importance, among others he was Clerk to the Commisssioners of Income Tax for the Division of Ardudwy; Clerk to the Dovey [Dyfi?] & Mawddach Fishery Board; Justice’s Clerk to the Towyn Bench; and he took an active part in the establishment of the Barmouth Library, of which he was a member of the Executive Committee for many years. He was a volunteer when the War broke out, and was immediately called up when hostilities began. He held drills for the V.T.C. at Barmouth and served at Newtown and other camps where he was gazetted Captain. He contracted illness and died in 1917. George Henry Douglas Davies was born on the 6th April 1888 in Oswestry, the fourth of five children of John Edward Davies, a farmer at ‘The Fields’ in Maesbury and Emma Jane Davies. He entered the University College of North Wales in 1909 where he was a keen sportsman being a member of both the Rugby and Cricket Teams. He afterwards enlisted with the Corps of Dragoons, Shropshire Yeomanry. George was killed in action on the 23rd August 1916 during the Somme Offensive, and was buried at Blighty Valley Cemetery near to Authuille, France. 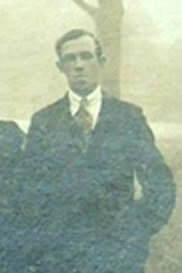 John Davies was born on the 27th July 1883 in Wrexham, the son of Edward and Hannah Davies, of 40 Cunliffe St., Rhosddu. He entered the University College of North Wales in 1901 where he studied Pure and Applied Mathematics, and afterwards became a school teacher of Maths in Brecon. He enlisted with the Royal Engineers and died from the effects of gas poisoning in November 1918 at the age of 34. The Rev. Emlyn Holt Davies was born in Machynlleth on the 19th April 1876, the eldest son of D. Edward Davies of Bronwylfa, Aberystwyth, by his wife, Mary, daughter of Lewis Holt. He entered the University College of North Wales in 1897 and obtained his degree in 1900. He married Winifred Williams, the daughter of David Williams of Abertillery, on the 29th March 1910, Talybont, Co. Cardigan, and had three daughters. He entered the Congregational Ministry, becoming a Missionary under the London Missionary Society in Calcutta. He subsequently returned to the United Kingdom, owing to ill-health, and held pastorates at Hadleigh, Pitsea, and the Westport Congregational Church, Malmesbury, where he settled in 1915. In November 1917, Westport Congregational Church, Malmesbury, granted their Minister four months’ leave of absence, when he volunteered for service with the Indian troops (as chaplain), and served with the Expeditionary Force in France from the 8th January 1918. He contracted meningitis and died at the Military Hospital in Cerisy-sur-Somme on the 18th March 1918. Thomas Llewelyn Davies was born on the 11th November 1892 in Swansea to William Davies and his wife Margaret of Dillwyn House, Brynhyfryd. He entered the University College of North Wales in 1911 where he studied History. He was a Major with the Royal Field Artillery and was killed on the 16th September 1918 whilst flying in RE8, D4746 of the Artillery and Infantry Co-operation School. He was awarded the Military Cross in 1917 for conspicuous gallantry and devotion to duty in reorganising a battery which had lost practically all its officers, N.C.Os., and gunners. Two days afterwards he not only commanded the battery in an attack, but personally laid the guns, and it was due to his example that the battery was able to change its position and come into action. He is buried in Swansea (Cwmgelly) Cemetery. Hubert Francis Day was born on the 22nd July 1895 in Milford Haven, to John and Margaret Day. He entered the University College of North Wales in 1913, and afterwards was commissioned into the Honorable Artillery Company, before joining the 11th Battalion, Royal Welsh Fusiliers. He was killed at the Battle of Langemarck on the 10th August 1917. His brother John Henry was also killed. John Llewelyn Edwards was born on the 18th June 1894, the son of John & Elizabeth Edwards, of Bodlondeb, Caerwys. 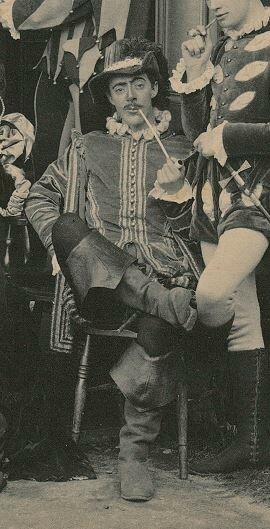 He was educated at the Merchant Taylors’ School, Great Cosby, before proceeding to the University College of North Wales where he studied Agriculture. A member of the Officers’ Training Corps, he was offered a commission on the outbreak of war. While waiting for his commission he joined the Grenadier Guards, and remained with them until he obtained a commissioned as a Second Lieutenant with 75th Brigade, Royal Field Artillery. He landed in France on 28 June 1915 to join the Brigade and was further promoted to Lieutenant in 1916. Edwards was killed in action on the 7th September 1917 aged 23 years. Rowland Edwards was born in Blaenau Ffestiniog on the 2nd December 1896 to Humphrey and Mary Anne Edwards of Summerhill Terrace. He entered the University College of North Wales in 1914. Rowland enlisted with the Royal Army Medical Corps on the 11th December 1915 at 19 years of age. He was admitted into hospital on the 29th April 1916 suffering with dangerous appendix and septic embolism. He died four days later on the 2nd May. David Ellis was born on the 1st February 1893 at Penyfed, Ty Nant, Corwen. He entered the University College of North Wales in 1910 and obtained a B.A. Hons. in Welsh in 1913. He joined the Welsh Students Company of the Royal Army Medical Corps early in 1916 and disappeared while serving in Salonica in June 1918 - his body was never found. A fictionalised account of his disappearance was written by Cynan (Albert Evans Jones) in "Ffarwel Weledig." An accomplished poet, he is the subject of Alan Llwyd and Elwyn Edwards book entitled "Y bardd a gollwyd" (the lost bard) [Cyhoeddiadau Barddas, 1992]. 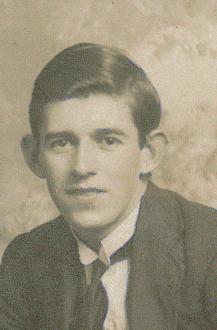 Eleazar Evans was born on the 21st June 1889 in Criccieth, son of O. T. and Ellen Evans, of Rhianfa. He entered the University College of North Wales in 1907 and worked with his father as a coal merchant before enlisting with the 8th Battalion of the Royal Welsh Fusiliers. 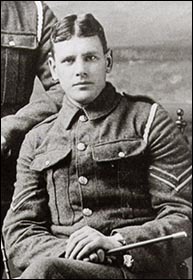 Corporal Evans was wounded in action on 26th January 1917 in Mesopotamia, and died of his wounds on the 19th February. He was buried in the Amara War Cemetery. 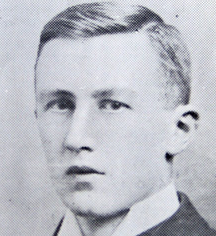 Robert Pritchard Evans, born 1884, of Melin Llecheiddior, Garn Dolbenmaen, Caernarfonshire was a student at the University College of North Wales from 1904, graduating with a degree in English in 1907. For a period he taught at the school in Trefor and later served as a 2nd Lieutenant in the 14th Service Battalion of the Royal Welsh Fusiliers. He was killed in France on the 11th April 1917. Robert Pritchard Evans was a close friend of the poet, R. Williams Parry, who wrote a series of englynion in his memory. Oswald Griffith was born on the 12th January 1888 to Robert and Annie Griffith of Bangor. He was educated at Friars School, later entering the University College of North Wales in 1906 where he was a member of the Boating Crew, the Rugby Team, the Drama Group and the Officers’ Training Corps. In 1909 he became the Headteacher of Harwick School, Gloucester, and then returned to North Wales two years later to take up position as Assistant Teacher at the Caernarfon National School. In May 1912 he went to teach at Westborough Road Council School in Southend. At the outbreak of the war he offered his services and was granted a commission as 2nd Lieutenant in the Royal Field Artillery attached to the 12th Division Artillery. He was killed in action in February 1915. A large memorial service was held at Bangor Cathedral in his memory (he was a member of the Cathedral Choir). Iorwerth Griffiths was born on the 1st June 1896 to Edward and Martha Griffiths of Worcester Road, Bootle, Liverpool. He was educated at Bootle Municipal Technical School and the County School, Llangefni, Anglesey. He subsequently entered the University College of North Wales in 1914 as an agricultural student, after being awarded a £20 Agricultural Exhibition Entrance Scholarship. He was a member of the University’s Officers’ Training Corps. before taking up his commission as 2nd Lieutenant in the 7th Battalion of the East Lancashire Regiment. He was killed in action on the 5th July 1916 during the final stages of the capture of La Boiselle. John Griffiths was born on the 23rd August 1881 to John and Jane Griffiths of Chester. He entered the University College of North Wales in 1899, where he was Captain of the Men’s (Science) Boating Crew and a member of the Officers’ Training Corps. He obtained his BSc in 1902, and then afterwards a degree in Teacher Training in 1903 which lead him to become a science master of Cleobury Mortimer College, Salop. He later took up a position Larne Grammar School, Co. Antrim, Ireland. Griffiths accepted a commission with the Ulster Volunteers, and was attached to the 12th Battalion of the Royal Irish Rifles, crossing to France in 1915. He was wounded in June, 1916, while leading his men in a bombing raid, for which he received congratulations. He was killed in action on the 1st July 1916 at the Somme. Kenneth Rees Habershon, born on the 8th July 1889, was the second son of Dr Samuel Herbert Habershon of Harley Street, London, and grandson of Mrs R. Davies of Treborth Hall, Bangor. He was educated at Winchester College and New College, Oxford, and was registered as a student at the University College of North Wales in 1913. He went to Canada after College and was in business at Winnipeg when war broke out, and, returning home, he joined the Rifle Brigade. He was quickly promoted, and in January 1915 was appointed Captain in the 12th Battalion of the Rifle Brigade. He fell near Ypres on February 12th 1916. He had insisted on going out under heavy fire to relieve a comrade and was struck by a shell while on the way. George Tilston Haley was born in July 1894 to George and Margaret Bentley Haley of Tŷ Tawel, Llanfaes, Anglesey. 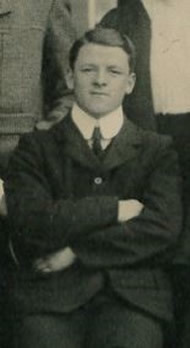 He progressed from Penmon School to Beaumaris Grammar School, afterwards securing a place at the University College of North Wales to study a Science degree in 1914. In 1915 he put his studies on hold to enlist with the Royal Welsh Fusiliers, however before completing his training he volunteered with the Royal Engineers and was posted to their ‘Chemists Section’ as a Corporal. After joining an Officers’ Training Course he joined the Welsh Regiment as a 2nd Lieutenant and served on the Somme in 1916. By the end of the year he had contracted trench fever and was invalided home and finally declared unfit for active service. He was then posted to Training Camps, first Yarmouth and then Kinmel Park (Bodelwyddan) where he helped to train the recruits before being demobbed on Christmas day 1918, as a Captain. 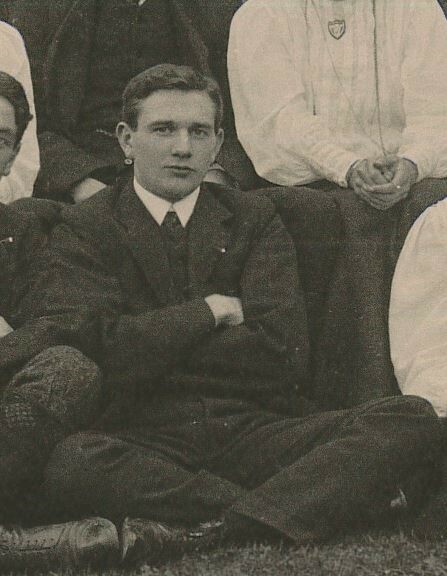 After the war, Haley returned to complete his Science degree at the University, graduating in 1920, after which he took up a position as Science Master at Sir Hugh Owen School in Caernarfon. Unfortunately in 1921 the infection he had contracted during the war had taken its toll, and George died at his home in Llanfaes on the 21st November 1921. William James Hardy was born on the 8th June 1895, the only son of Benjamin Tilsley Hardy and Phoebe Selina Hardy, of Ty Hyfryd, Denbigh. As a pupil of Denbigh County School he was a bright scholar and had a successful course, being thought highly of by the Headmaster and staff. 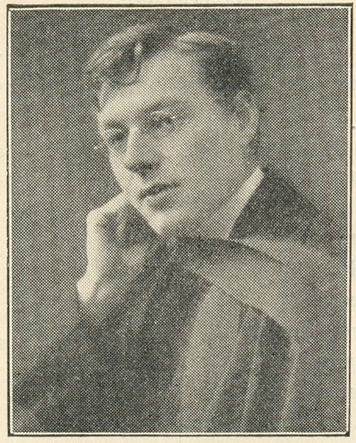 Being desirous of adopting the profession of electrical engineer, he had proceeded to the University College of North Wales in 1914, interrupting his studies to enlist with "A" Coy. 17th Battalion of the Royal Welsh Fusiliers. He was admitted to hospital in France with gunshot wounds sustained during battle on the 12th July 1916 and died the following day. Alan Gordon Harper was born on the 5th January 1889, the 2nd son of Peter Harper and his wife Catherine, of Bromley, Kent. He was educated at Dulwich College and Magdalen College, Oxford, where he was a Demy. He took Botany honours in 1912, and the same year became assistant to Dr R.W. Phillips, Professor of Botany at the University College of North Wales. In a few months he returned to Oxford as demonstrator to Professor Somerville at the School of Rural Economy, where he obtained, with distinction, the Diploma in Agriculture. In 1914 he accepted the appointment of Professor of Botany at Presidency College, Madras, returning to London shortly after on the outbreak of war where he obtained a commission in the Royal Field Artillery (R.F.A.). He served with the Expeditionary Force in France and Flanders for eighteen months, until being wounded at Longueval on the Somme in July 1916. Upon his recovery he returned to the front as part of the 187th Brigade of the R.F.A. It was while serving with this unit that he was killed in action at Messines on the 1st June 1917 at the age of 28. Edgar Henry Harper was born on the 4th July 1880, the eldest son of Henry M. and Annie Harper of Northland Place, Dungannon. He was educated at the Royal School, Dungannon from 1892 to 1899. He was the McCullagh Prizeman and Bishop Law’s Prizeman at Trinity College Dublin, where he graduated in 1902. He also graduated in the Royal University of Ireland, containing first-class honours in mathematics and mathematical physics at both the B.A. and M.A. degree examinations in 1904 and 1905. Edgar was an assistant lecturer in Mathematics at the University College of North Wales where he took particular interest in the mathematics of flight. He was appointed assistant to Professor George Hartley Bryan, who had been carrying out similar research in the stability of the early aeroplanes. He left in September 1914 to take the Professorship of Mathematics at Cork University. 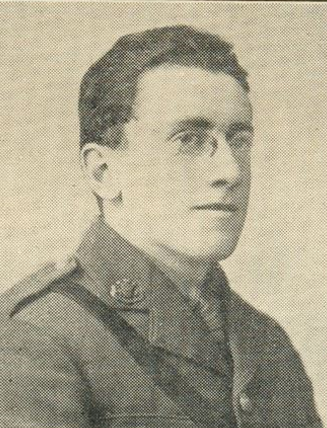 With the outbreak of war, Edgar relinquished his post in Cork to volunteer in the service of his country.In May 1915 he obtained a commission with the 7th Royal Munster Fusiliers, later transferring to the 8th Battalion South Staffordshire Regiment, with whom he was promoted to Lieutenant. The battalion took part in the Somme Offensive in early July 1916, a battle in which he was killed on the 10th July 1916, aged 36. Frederick Thomas Harris was born on the 11th December 1890 to Arthur and Margaret Harris of Bishops Castle, Shropshire. He entered the University College of North Wales in 1913 to study an engineering degree, matriculating in the summer of 1914 before enlisting with the Royal Field Artillery as 2nd Lieutenant. He was wounded on the 10th August 1915 during battle, and died on the 19th September. George William Hastings was born on the 2nd June 1882, the son of Charles and Amelia Hastings of Wimbledon Surrey. He entered the University College of North Wales in 1901, achieving both the Powis and Gladstone Prize, and graduating with a Second Class Honours in English in 1906. 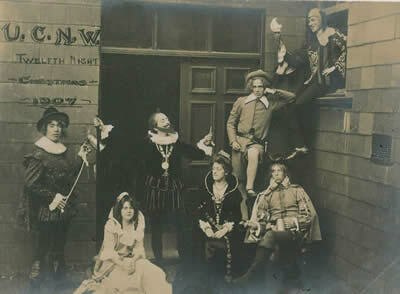 Whilst at the University he was a member of the Drama Group and the Men’s Boating Crew. He enlisted as a private in the Monmouthshire Regiment and later took up a commission as a Second Lieutenant, 3rd Battalion of the Monmouthshire Regiment. He was transferred in the field to the 10th Battalion of the Cheshire Regiment. He died on the 1st August 1917 on the second day of the Third Battle of Ypres probably during the attack on Pilckem Ridge. John Hughes was born on the 12th May 1889, the eldest son of William and Elizabeth Hughes, of 106, Water Side, Aberffraw, Anglesey. He was also the husband of Jane Ellen Hughes, of 71, Bangor St., Aberffraw. He entered the University College of North Wales in 1908, obtaining his BSc in 1913. Little is known of his life after graduating. John enlisted with the Royal Welsh Fusiliers, 'D' Coy. 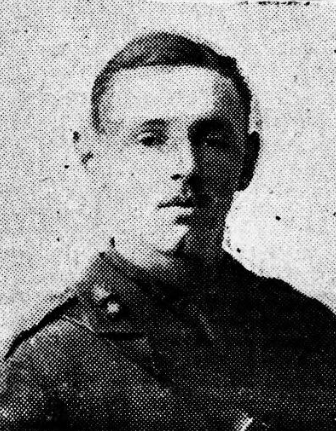 1st/6th Battalion, and was killed in action on the 27th March 1917, aged 27. His name is included on the Jerusalem Memorial in Israel. John Edwyn Hughes was born on the 8th December 1886, the only son of Edward and Mary Ann Hughes, Augusta Place, Portdinorwic. He was educated at the Port Dinorwic Board School, the Carnarvon County School and then the University College of North Wales where he graduated in 1911 with a BA First Class Honours in History. He was also member of the Officers’ Training Corps whilst at the College. At the time of his enlistment he held a scholastic appointment at Llandudno Central School, Trinity Avenue. On the outbreak of war, John volunteered to join the Royal Welsh Fusiliers, 10th (Service) Battalion, moving up through the ranks from Lance Corporal to 2nd Lieutenant. He was shot through the shoulder and thigh during an attack on Lonely Trench near Guillemont in France, and died on the 19th August 1916 from his wounds. John left a child as well as a widow, Sidney Ellen Hughes. 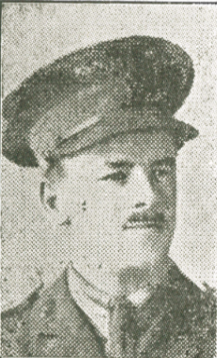 He is remembered as Edwin J Hughes on the Llandudno War Memorial & Memorial Chapel, Holy Trinity Church, and as Lieutenant Edwin John Hughes on the Llandudno Roll of Honour. John Gwilym Hughes was born on the 7th May 1881, the only son of John and Mary Hughes of Hazelwood, Bangor. He was educated at St Paul’s School, Friars School and then the University College of North Wales where he gained a BA degree. 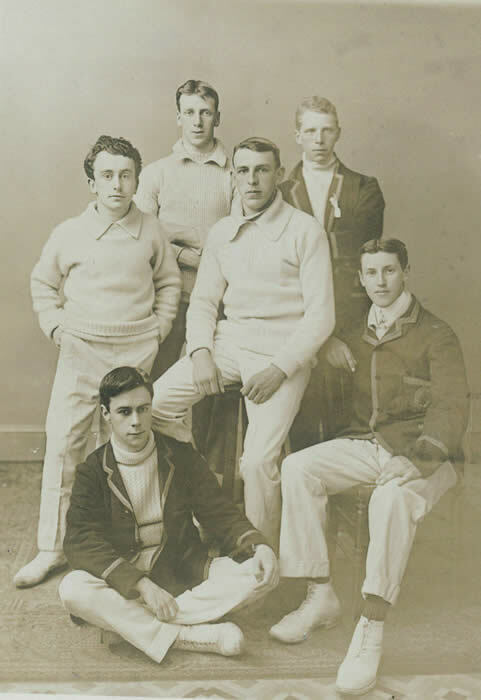 He was noted as being one of the most popular students – he was a member of the Officers’ Training Corps and won “colours” both at football and cricket. Upon graduating he began a career in teaching, serving as senior master at Llanidloes County School, in Mid Wales. Later he became assistant master at his old school, Friars in Bangor. While there he played an active part in the visit of the National Eisteddfod of Wales to Bangor in 1915. John was an enthusiastic member of the Honourable Society of Cymmrodorion in Llanidloes, later becoming secretary of the society’s Bangor branch after moving to Friars School. He left Friars on receiving a commission with the 3/6th Battalion Royal Welsh Fusiliers in Autumn 1915. He was promoted to 2nd Lieutenant in Summer 1916, shortly before leaving for the Western Front on 6 September. He was accidentally killed on 28 October, and his parents were told of his death, aged 35, on the 3rd of November. Frederick Sinclair Wills Jennings was born on the 11th November 1881, the eldest son of Frederick Wills Jennings of Selborne Place, Hove. He was educated at St. Paul’s School (foundation scholar), Wren’s and Edinburgh University before entering the University College of North Wales to study Agriculture. After finishing this course he went to Canada and took up land in British Columbia, but on the outbreak of war volunteered for active service overseas with the West Mounted Rifles, 23rd Battalion at Calgary in 1914. After training in Quebec he came over with the Reserve Battalion of the 1st Contingent to Shornecliffe in March 1915, went to the Front in May, and was shot through the head by a sniper while on duty in the trenches near the Bois de Ploegsteert Wood, Belgium, on the 6th July 1915. Robert Jervis was born on the 22nd of December 1895, the son of Thomas, the headmaster of Glanogwen School, and Eliza Jervis of Gerlan Schoolhouse, Bethesda. He entered the University College of North Wales in 1913 to study an Arts degree and was the recipient of the Robert Gee Prize. On the outbreak of the war he joined the 13th Royal Welsh Fusiliers (“Pals” Battalion) as a private, and was gazetted as a 2nd Lieutenant just before his death. He died of wounds sustained during a bombing accident in France on the 20th January 1916. Albert Edward Jones was born on the 21st December 1889, the son of Thomas and Elizabeth Jones of Glantraeth Farm, Bodorgan, Anglesey. He entered the University College of North Wales in 1909 and afterwards assisted on the family farm before enlisting with the 16th Battalion of the Royal Welsh Fusiliers in Llandudno during 1915 at the age of 24. The Battalion took part in fierce fighting at Mametz, France, in which Albert was wounded and killed on the 10th July 1916. A mural tablet in his memory was unveiled at St. Beuno’s Church, Trefdraeth, in the August of 1918. Cadwaladr Herbert Jones was born on the 25th January 1891, the son of William and Elizabeth Jones, of Graig Villas Penygraig, Brymbo, Wrexham, later husband of Mary Hughes, Beaumont, Brymbo. He entered the University College of North Wales in 1909, obtaining a Teachers Training Certificate in 1913, before enlisting with the Royal Field Artillery (WAC). 2nd Lieutenant Cadwaladr was wounded in France in 1917 and hospitalised for several months. Unfortunately his health broke down and he was conveyed home to Brymbo where he died on the 24th September 1918. He is buried in St. Mary’s Churchyard, Brymbo. Cledwyn Owen Jones was born on the 24th September 1880, the eldest son of John and Jane Jones of 352 High Street, Bangor. After entering the University College of North Wales in 1900 and obtaining his degree, he took up position as an Assistant Schoolmaster first at St. Paul’s School, Bangor, and at the outbreak of the war as Schoolmaster in London. He enlisted in August 1914 in the Empire Battalion, Royal Welsh Fusiliers, subsequently receiving a commission in the Welsh Regiment. He died on the 5th May 1917 at the Tuberculosis Hospital Llangefni, Anglesey. Gwilym Arthur Tegid Jones was born in Bangor on the 16th April 1886, the son of Lewis Davies Jones of Edge Hill, Bangor, Schoolmaster (well known as Llew Tegid, the Welsh National Eisteddfod Conductor), by his wife, Elizabeth. He was educated at the local Board School, Friars School, Bangor and then Aberdare County School before entering the University College of North Wales where he took the degree of BSc in 1909. After leaving College he became assistant master at The King Edward VII Boys’ Grammar School, Chelmsford, and from there he took up a post at Stourbridge Grammar School. When he joined the army in 1915 he was on the teaching staff of Saffron Walden Grammar School. He was gazetted 2nd Lieutenant of the Royal Garrison Artillery (41st Battery) and Lieutenant on the 6th June 1916, taking part in the engagements at Vimy Ridge on the 9th April and Messines Ridge on the 7th June following. He was killed in action at Ypres on the 25th October 1917. Harold Vivian Jones was born on the 6th June 1893 to Robert William Jones and his wife Agnes Annie Jones of The Pines, Builth Wells. He was educated at Builth Wells County School, succeedeing in 1911 to the University College of North Wales where he completed his training for a scholastic career. 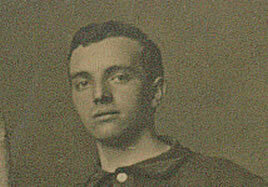 As a student he was Captain of the University Football Team and at home one of the first members of the Builth C.L.B. At the outbreak of the war he and his brother (Captain J. Gordon Jones) received commissions and both were attached to the 13th Battalion of the Royal Welsh Fusiliers. 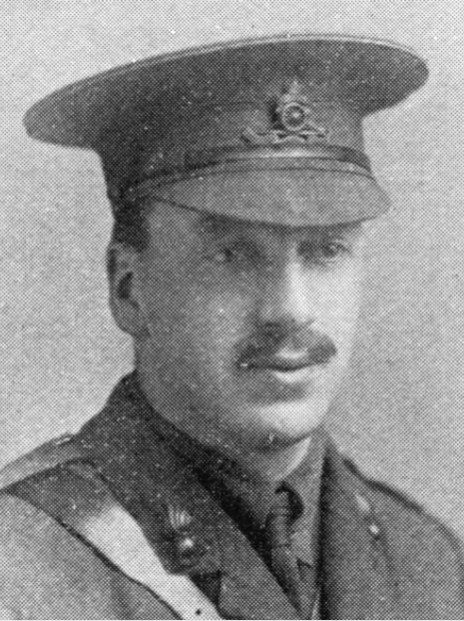 Lieutenant Jones fell in battle at Mametz Wood on the 10th July 1916. John Owen Jones was born on the 3rd June 1895 at Cemaes, Anglesey to Thomas and Hannah Jones, later of Twnan Uchaf, Dolwen, Abergele. He was educated at the Northern Institute Liverpool and later the University College of North Wales in 1914 where he served with the Officers’ Training Corps. After serving with the 2/9th Kings Liverpool Regiment as Quarter Master Sergeant, he received a commission as 2nd Lieutenant into the 15th Battalion of the Welsh Regiment, later moving to the 16th. On the 6th June 1917, at the age of 22, he was killed in action during a trench raid at Boesinghe while Acting Captain leading a Company. Llywelyn Penri Jones was born on the 8th April 1892 in Nant, Coedpoeth, the fifth of seven children of Daniel and Anne Jones, High Street, Rhostyllen, Wrexham. He was educated at Bersham Elementary School and later Grove Park County School for Boys where he left in 1914 as a Student Teacher shortly before entering the University College of North Wales as a theological student. It was whilst living and studying in Bangor that he signed up for war service in 1915. In January 1916 he left the University to train for the Royal Army Medical Corps (Welsh Students Company) at Llandrindod Wells and Sheffield. He embarked at Southampton on the 10th September on board the H.S. Essequibo (a Hospital Ship) destined for Salonica. Unfortunately Llewelyn had been affected by ill health during his short career with the Company and on the 7th November 1918 he died from Pneumonia in the 38 General Hospital, Salonica, his body buried at Mikra British Cemetery, Kalamaria. He was 26 years old. Owen Gwilym Jones was born on the 30th April 1886, the son of Captain and Mrs. Edward Jones of Mount Pleasant, Penrhyndeudraeth. After graduating from the University College of North Wales he held the post of assistant master at the Holyhead County School, later moving to a similar post at Ystalyfera County School, and afterwards at Tredegar County School - a position which he relinquished to join the forces. He was granted a commission in the 3/7th Battalion of the Royal Welsh Fusiliers as 2nd Lieutenant. Whilst leading his platoon during an attack on the 26th March 1917 in Egypt he was killed in action. He is commemorated on the following memorials: The University College of North Wales Memorial Plaque, Main Arts Building; Ystalyfera County School War Memorial; the memorial housed at Tredegar Comprehensive School; the memorial at the new offices of Monmouthshire County Council (dedicated to teachers of the County Intermediate Schools of Monmouthshire who died in the First World War); and Tredegar’s town cenotaph. Richard Jones was born on the 25th June 1888 to John R. and Jane Jones of Glanyrafon Terrace, Tanygrisiau, Blaenau Ffestiniog. 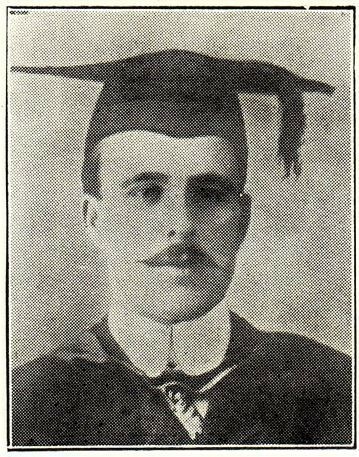 He entered the University College of North Wales in 1906 and upon graduating was appointed assistant master at Bontnewydd County School in 1908. When war broke out Richard enlisted with the 13th Battalion of the Royal Welsh Fusiliers – one of the first teachers in the County of Caernarfon to do so. The Battalion embarked for France in the December of 1915 where, due to his bravery on the battlefield, he was made Lieutenant. About three weeks before his death he transferred to the 2nd South Lancashires. He was killed in action in France on the 21st October 1916. Richard Jones, College Boatman, A.B. 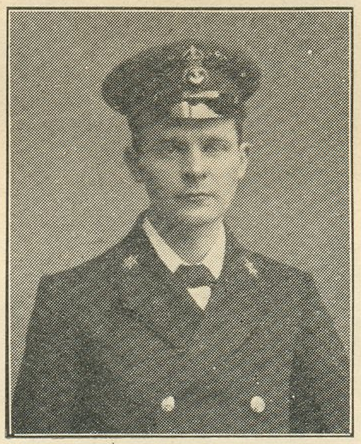 R.N., died 1917. This is all the information we have for this individual unfortunately. Rhys Harris Jones was born on the 31st July 1886 in Battersea, London, to Evan and Adeline Jones of Pwllheli, originally of Rhymney. Jones entered the College in 1905 with an entrance scholarship of £40 and later was awarded an exhibition for the second training course in 1909. He took second-class honours in English in 1908 and second-class honours in history 1909. While at the College he was president of the Students’ Representative Council. After graduating he was appointed to a post at the Small Heath Secondary School in Birmingham, later moving to a position in Pitcombe, Somerset. He received a Commission as 2nd Lieutenant in the South Wales Borderers in October 1914, stationed at Tidworth near Salisbury. He was killed in action in France on the 8th October 1918. Thomas Elwyn Jones was born on the 14th October 1889 to Samuel Thomas Jones, Calvinistic Minister, and his wife Mary, of Rhyl. 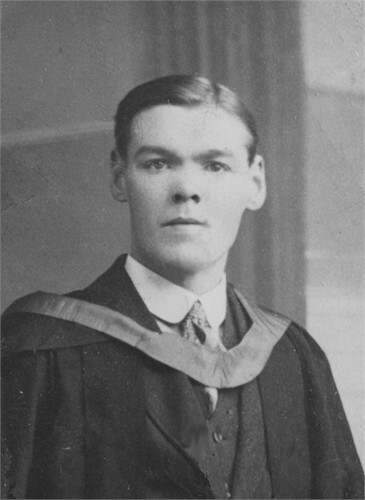 On leaving school Thomas was accepted into the University College of North Wales in 1908 where he obtained a First Class Degree in Mathematics. 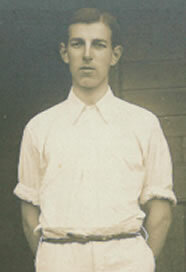 He was also a keen sportsman at College, where he was a member of the cricket, football and tennis teams. 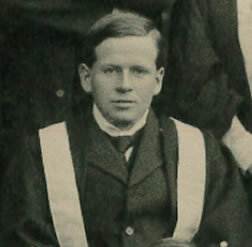 Thomas was appointed Senior Mathematics Master at Carmarthen Grammar School in 1912, after which he moved to Greenwich in July 1914 to study at the Royal Naval College. 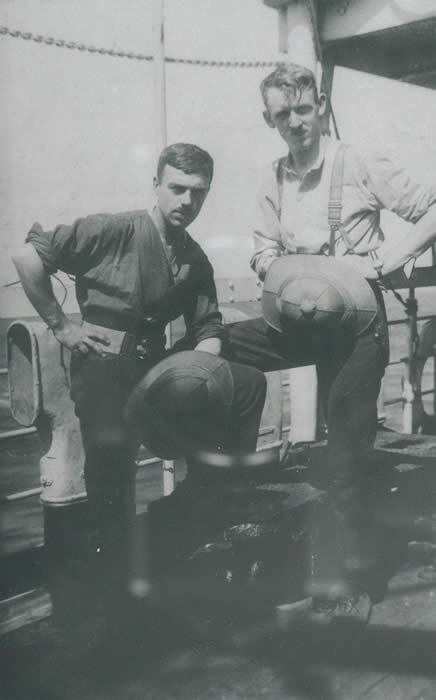 In December 1916 he joined the crew of HMS Defence, one of his duties being to teach Mathematics and Physics to the Ship’s Midshipmen. On the 31st May 1916 HMS Defence took part in the largest naval battle of the war, the Battle of Jutland, which took place off the North Sea coast of Denmark's Jutland Peninsula. Escorting the main body of the Grand Fleet, the ship was fired upon by a German battlecruiser and four dreadnoughts and was sunk. Thomas was one of the 903 men on board who lost their lives that day. There were no survivors. Thomas John Jones was born on the 10th of January 1891 to Thomas Jones of Penrhoslligwy, Amlwch. He attended Tynygongl School before entering the University College of North Wales in 1912, leaving in 1916 to join the Royal Welsh Fusiliers. He was killed in action in August 1917. Thomas John Jones was born on the 9th of September 1889, the youngest son of the Rev. Evan Jones, Congregational Minister, Llanbedrog. 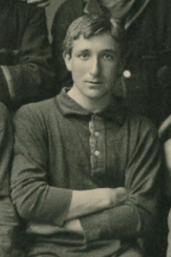 He entered the University College of North Wales in 1910, where he was familiarly known as “Llan,” and was the Treasurer of the College Football team before being gazetted in August 1914, obtaining his commission in the same month. He went out with the 122nd Brigade Royal Field Artillery "A" Bty. (Welsh) in December 1915, and went through the fighting on the Somme front during 1916 and the offensive of 1917, being wounded during the August of the same year. Thomas was invalided home, but went out again in the December. 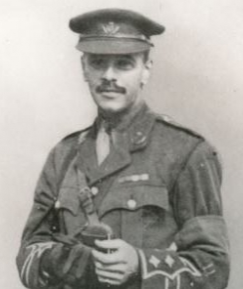 He was twice promoted, first to Lieutenant and afterwards to acting Captain and was awarded the Military Cross for conspicuous gallantry and devotion to duty. He was killed in action in Belgium on the 22nd April 1918 at the age of 28. No information can be found relating to this individual unfortunately. He was not a student at the University College of North Wales, so may have been a member of staff. The Rev. William Evans Jones was the son of Eliza Evans Jones and David Jones, Portdinorwic. He first served as a Private with the 16th Battalion of the Royal Welsh Fusiliers, but being wounded (he was shot in the right hand) he was discharged in May 1916 and resumed his duties at Bangor College as a Ministerial Student. 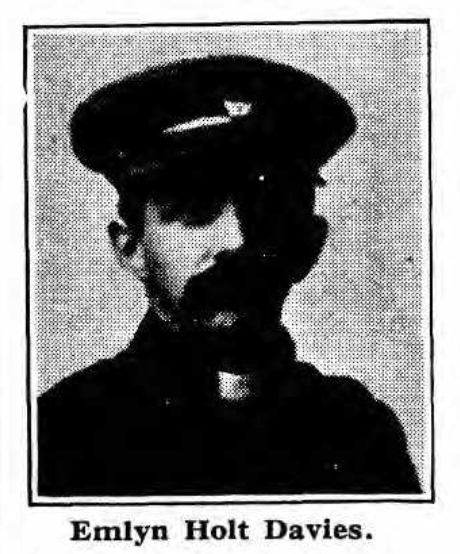 William was ordained at Caersalem Church in Caernarfon in 1917, straight from College, and then entered upon his services as Chaplain, attached to the 2nd Battalion Royal Welsh Fusiliers (Army Chaplains’ Department). His Colonel reported that he went out with one of the units during an assault on the 8th October 1918, and was killed whilst ministering to the wounded during the battle. He was 24 years of age. He is also commemorated on the Felinheli (Port Dinorwic) Memorial. William Thomas Jones was born on the 4th July 1892, the son John and Margaret Jones of Pennant Farm, Denbigh. Prior to entering the University College of North Wales in 1912, where he obtained his College Certificate in Teachers Training, he was a School Teacher under the employ of the Denbighshire Education Authority. Upon graduating he took up position as Assistant Master at the Elementary School in Abergele. According to his Army Service Record he enlisted with the 21st Battalion of the Royal Welsh Fusiliers as a Private at Kinmel Park on the 7th February 1916, transferring to the 3rd Battalion on the 28th August and then later the 2nd Battalion in the same year. On the 25th October he was wounded and embarked for Southampton from Rouen, joining the No. 5 Infantry Base Depot (a holding camp). He soon recovered and was sent back to the Battalion. 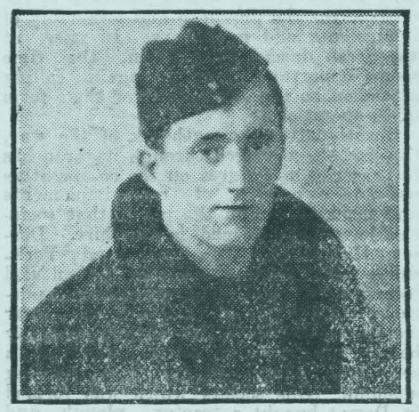 William (‘Willie’) was wounded in action on the 23rd April 1917, later dying of his wounded on the 27th. Joseph Richard Joseph was born in the United States on the 2nd August 1890, to the Welsh Calvinistic Methodist Minister Edward Joseph and his wife Catherine (Kate). The family were residing in Garn Dolbenmaen when Joseph entered the University College of North Wales in 1908, later obtaining his B.A. degree in History and English in 1912. From 1912 to 1913 he studied in Germany, returning to the United Kingdom to take up position as a school teacher in History in Farnham. He enlisted with the London Regiment County of London Artist's Rifles Battalion as Lance Corporal in the early months of the war, and was wounded during a fierce battle in France. He died of his wounds on the 25th March 1918. Thomas Reginald Knowles was born on the 21st February 1891 to David and Margaret Knowles of Vale Street, Denbigh, later Arfryn, Park Street. 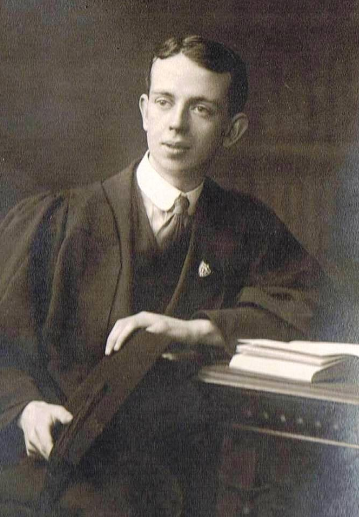 He entered the University College of North Wales in 1908, achieving his BA degree in 1911 before pursuing a career in the law profession by reading for the Law Society exams in 1912. He soon became a solicitor and served his articles with Mr A. O. Evans. His military career began in November 1915 as a Private in General Service. He was then posted to the 21st Battalion of the Royal Welsh Fusiliers in January 1916 in Kinmel Park. He was promoted to Lance Corporal in July 1916 shortly before travelling overseas when he was posted to the 10th Battalion Royal Welsh Fusiliers. He was killed in action in France on the 13th November 1916, aged 25 years. Thomas is also commemorated on the Denbigh War Memorial. Arthur Moore Lascelles was born on the 12th October 1880, the son of John Lascelles, Penmaen Dyfi, Machynlleth, and Mary Elizabeth Lascelles. He was educated at Malvern School and Uppingham School, Rutland, before entering the University College of North Wales as an agricultural student in 1899, leaving Bangor to study medicine at Edinburgh University. He abandoned his studies and emigrated to South Africa where he began his military career in 1902 with the Cape Mounted Rifles. By October 1915, with the rank of Quarter Master Sergeant, he had decided to return to England and obtained a discharge from his unit. In England he was commissioned as a 2nd Lieutenant in the 3rd Battalion Durham Light Infantry, later becoming attached to the 14th (Service) Battalion. He was wounded for the 1st time at the Somme in September 1916. On the 15th June 1917, Arthur was awarded the Military Cross for “great Courage, endurance and initiative.” On the 23rd March he was presented with the Victoria Cross by King George for his actions in December 1917 during the Battle of Cambria, where, although wounded during a heavy bombardment, he held back the enemy. When part of his trench was captured he mounted the parapet with his remaining men and drove 60 of the enemy back. His trench was captured again but he managed to escape, despite receiving further wounds. Despite severely wounding his right arm he returned to active service and joined the 15th (Service) Battalion in France. 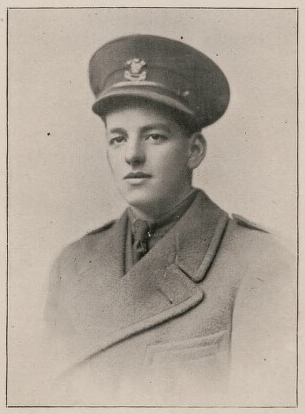 Lascelles was killed in action at Limont-Fontaine, France, on the 7th November 1918. Robert Lewis was born in 1886 to John Lewis of Holyhead. He entered the University College of North Wales in 1905 and qualified as a teacher having gained a BA degree, and took up a position in the Church of England County National School, Holyhead. Robert enlisted as a Private with the 16th Battalion of the Royal Welsh Fusiliers, having formerly joined the 13th (the 16th Battalion was formed in Llandudno in November 1914 from recruits surplus to the 13th Battalion). The Battalion arrived in France with the 38th (Welsh) Division in December 1915 and in July 1916 was located on the Somme. The Division took over the line below Mametz Wood on the 6th July and it was here, on the 11th July, that Robert was killed in action. He was 30 years of age. Edward Leopold Milner-Barry was born in Scothorne, Lincolnshire, on the 13th January 1867, to Edward Milner-Barry, the Vicar of Scothorne, and his wife, Adelaide. He was educated at the Universities of Cambridge, Berlin and Kiel, and was a scholar of Caius College, Cambridge, where he studied Modern and Medieval Languages. From 1891 to 1907 he was one of the chief modern languages masters at Mill Hill School, and for many years was examiner in German for the Universities of Cambridge and London, and also in 1914 for the Universities of Oxford and Leeds. In 1907 he was appointed lecturer in German at Birkbeck College and was recognised as a teacher of German in the University of London. In 1909 he was appointed lecturer of German and Teutonic Philology at the University College of North Wales, a position the Senate decided to advance to Professorship status in light of his high attainments. He was residing at Plas Lodwig, Bangor, with his wife Edith Mary, when he was accepted by the Admiralty as an interpreter in September 1914, taking the temporary rank of Lieutenant, Royal Naval Volunteer Reserve (RNVR). During his absence from his University employment his daughter Alda Milner-Barry stepped in to assist with his classes. 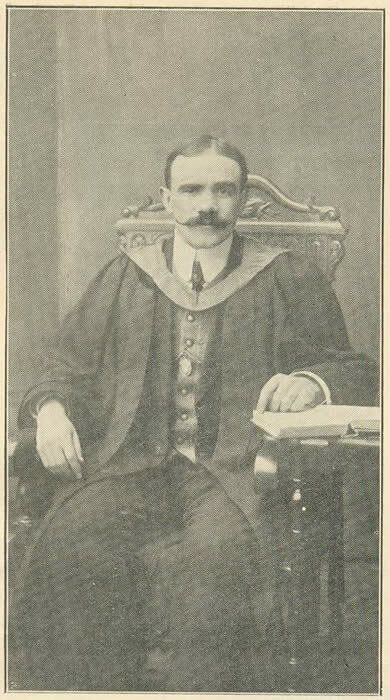 Professor Milner-Barry was a popular citizen of Bangor, by the fact that he took an active part in local institutions and popular movements which brought him in touch with a larger section of the public than if he had confined himself to purely educational circles. He was for some time chairman of the Bangor Local Governing Body and took a real interest in the work of both Friars and the County School for Girls. A keen golfer, he was for a while captain of the Bangor Gold Club. He died from heart failure on the 7th May 1917 at the Grimsby and District Hospital. Robert Williams Morris was born in Liverpool on the 12th August 1895, to Captain Robert Williams Morris Senior, a ship’s captain, and Margaret Morris (nee Williams). Robert and his brother were brought up in Singapore but both were sent back to Wales to stay with their Aunt and Uncle Williams in Betws y Coed to further their education. 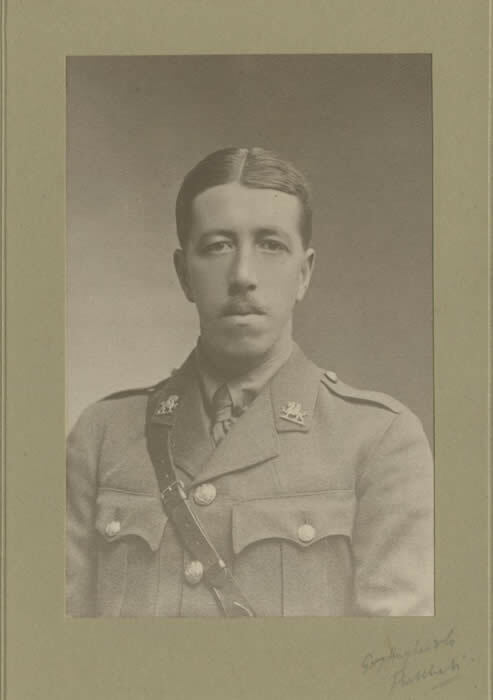 He entered the University College of North Wales in 1913, and enlisted in 1915 at the Inns of Court Officer Training Corps, transferring (without a commission) to the 14th (Service) Battalion of the Hampshire Regiment in July 1916. They were part of the 116th Brigade, 39th Division, and disembarked at Le Havre on the 6th March 1916. 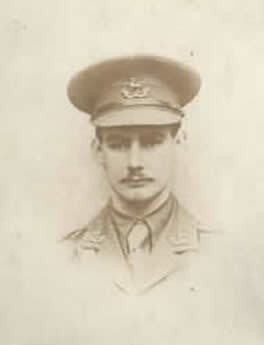 Robert was killed in action in France on the 26th September 1917, aged 22. He is remembered on the Betws y Coed War memorial, the Singapore Cenotaph and the Tyne Cot Memorial. Alfred Stanhope O’Dwyer was born on the 1st July 1897 in Cheadle Hulme to Stanhope and Maud O’Dwyer, later of Bramhall, Cheshire. Alfred was educated at Macclesfiled and Manchester Grammar Schools and then a School at Sandbach. It was whilst at Sandbach that he gained a scholarship to study at the University College of North Wales. He joined the Officers’ Training Corps in 1915 and was commissioned as a 2nd Lieutenant on the 26th July 1915 with with the 12th Battalion (Reserves) of the Royal Warwickshire Regiment (his Student Register entry states 12th Battalion, but his Military records state 14th Battalion). 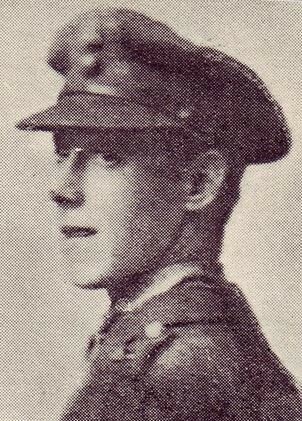 Alfred was killed in Action at the age of 19 on the 30th July 1916. He is commemorated on the Thiepval Memorial, Somme, France. Harold Oughtred was born at Hartlepool on the 15th September 1877 to John and Marianne Oughtred, ‘River View,’ Hessle, and Kettley Thorpe, Brigg, Lincolnshire. He entered the University College of North Wales in 1894 to study a Classics degree, later obtaining an MA at Oxford and London. Harold became an assistant at a number of grammar schools before enlisting with the East Yorkshire Regiment (4th Battalion, Territorial). He was killed in action on the 23rd April 1917 in France, aged 39. His name is recorded on the Hessle Roll of Honour, All Saints Parish Church. Evan Richard Owen was born on the 7th January 1891 to Richard William Owen and Jane Owen of Fferam Paradwys, Bodorgan, Anglesey. He entered the University College of North Wales in 1907, returning to Bodorgan soon after obtaining his degree to assist on the family farm. Evan enlisted with the 86th Brigade of the Royal Field Artillery, achieving the rank of Major before he was killed in action on the 28th April 1917 in France. He is remembered on the Llangristiolus War Memorial. Evan Rogers Owen was born in 1883 to William and Catherine Owen of ‘Llys Dorfil,’ Blaenau Ffestiniog. He entered the University College of North Wales in 1909 to study a course in forestry and agriculture, qualifying in both subjects. He immediately obtained a Government appointment as assistant superintendent of Agriculture in Southern Nigeria. He had been in the service for three years and was returning to Nigeria aboard the passenger liner S.S. Falaba when it was torpedoed by a German submarine on the 27th March 1915. Evan was one of the 104 passengers who perished. Vernon Elias Owen was born on the 20th September 1893, the only son of the Rev. T.E. Owen, M.A., Vicar of Aberdaron and his wife Eleanor. 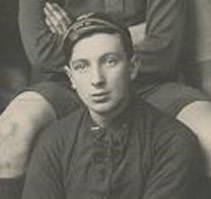 He attended Friar’s School, Bangor and went on to study Theology at the University College of North Wales in 1913, where he was a member of the College Football Team (at one time their Captain) and the Cricket Team. 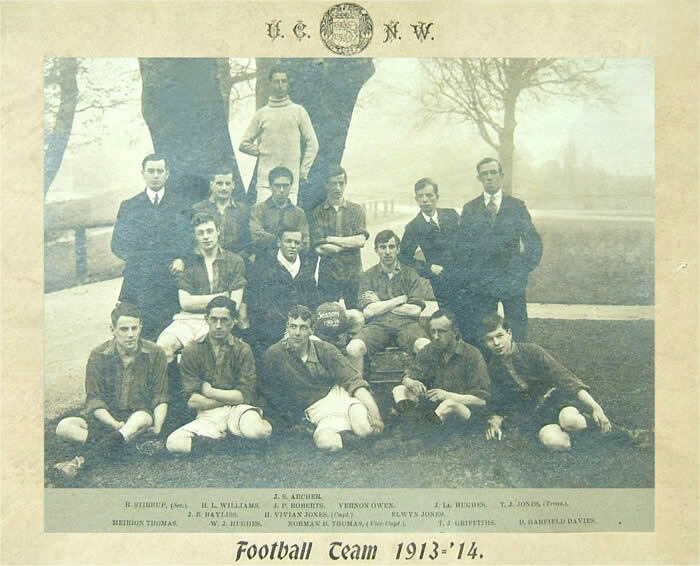 Vernon was also a member of the University’s Officers’ Training Corps and enlisted as a Private on the 10th October 1914 whilst at the institution. He joined up as a temporary 2nd Lieutenant with the 9th (Service) Battalion of the Royal Welsh Fusiliers. On the 10th November 1915 Vernon was wounded when a bullet struck him in the thigh, shattering his bone, and he was transferred to the No. 1 Red Cross Hospital at Le Touquet, France. On the 29th November his family were informed that he had died from secondary haemorrhage following the shell wound. He is buried in Camiers Road Cemetery, Etaples. John William Parry was born in Llanberis on the 29th May 1880 to Charlotte and William Parry, Maes Llwyn, Newton Street. He was educated at Ysgol Brynrefail and the University College of North Wales (entering in 1898) before taking up position as an assistant teacher of French at a grammar school in Richmond, Surrey. A resident of Gunnersby, London, John enlisted with the 1/23rd (County of London) Battalion, London Regiment, serving as an interpreter and despatch rider. He was shot by a sniper and died of his wounds on the 16th November 1915 at the age of 35. John Vernon Fitzgerald Prestidge was born on the 9th January 1894, the only son of Mr & Mrs Frank Prestidge, Victoria Park, Bangor (later 10 Augusta Street, Llandudno), and grandson of the late Mr W O’Brien Fitzgerald, Bangor. He was educated at Ysgol Friars and later articled to Mr Meacher, auctioneer and estate agent, of Penmaenmawr and Conwy. On 15th September 1914 he joined the Public Schools Boys Battalion and went to Epsom, where he was nominated for Sandhurst the same year. In Spring 1915 he joined the First Suffolk Regiment and immediately proceeded to Salonika and the Bulgarian frontier, where he was wounded. Upon his recovery he went out to France and was in the first battle of Loos (where he was promoted to First Lieutenant for his valour on the field), the Somme, Ovillers, Posieres, Fleurs. He was acting Captain in 1916-17 but was again wounded, this time in the hand and arm, and was also badly gassed. After recovering he was detailed light duty in an English training centre but again returned to France. Wounded and reported missing at Arras on 28 April 1917, he was brought to a clearing station two days later, very weak, but succumbed to his injuries on 2nd May 1917, aged 23, and was buried in Aubigny Communal Cemetery Extension, Pas de Calais. Rhys Morris Prichard was born on the 31st July 1891 to Rees And Mary Elizabeth Prichard, Leeds House, Chwilog. He entered the University College of North Wales in 1912, achieving a BA degree in Welsh in 1915. He enlisted in December 1915 and joined the 21st Royal Welsh Fusiliers in February 1916 at Kinmel Park, transferring later to the 16th Battalion. He was killed in action on the 29th August 1916. Harry Pritchard was born on the 24th May 1894, the eledest son of William H. Pritchard and Margaret Ann Pritchard of King Street, Cefn. He was on the teaching staff of the Cefn Mawr Council School and was preparing for a scholastic career at the University College of North Wales in 1914 when he joined the army. He enlisted in September 1917 at Shotton, and received a commission with the 12th Battalion of the Royal Welsh Fusiliers. He was awarded the Military Cross in January 1917 (as Temp. 2nd Lieutenant) for conspicuous gallantry in action. When all his men were wounded he remained with a Sergeant who was badly wounded and held his position. On another occasion he led an offensive patrol and bombed an enemy working party. The University Student Registers record that he died in September 1924. John Pritchard was born on the 28th September 1893. He and his sister Grace lost their parents at a young age; Grace was brought up by her Aunt and Uncle in Friars Road, Bangor, whilst John was raised by his grandparents in Bethesda. After completing his course in teacher training he entered the University College of North Wales in 1913. In April 1915 he joined the 13th Battalion of the Royal Welsh Fusiliers, undertaking his training in Llandudno and Winchester before being sent to France where he was promoted to the rank of Lieutenant. He was severely wounded and sent to a hospital in Paris for treatment. He was sent back to the battlefield where he was injured for a second time. After recovering again he was sent back to the battlefield for a third time where he was mortally wounded in action in the August of 1917 at the age of 23. He was buried in the “Bard College” Cemetery, Boesinge, France. James Thomas Richards was born on the 19th May 1893 in Mountain Ash to Robert and Elizabeth Richards. He was only a young boy when his father died so he and his siblings resided with their grandmother and mother in Granville Terrace. James was married to Jane and they had lived at 22 Little Wind Street, Aberdare. 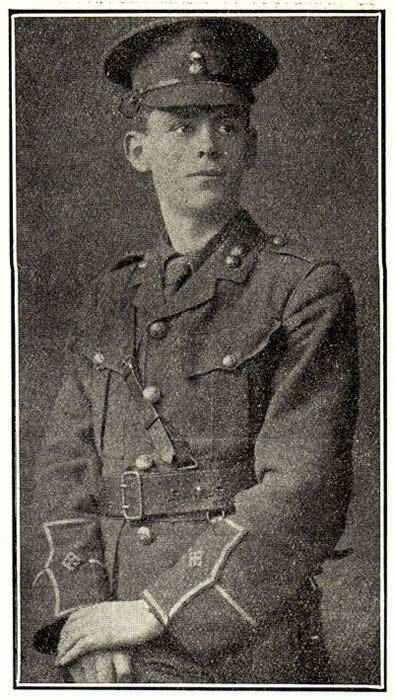 He entered the University College of North Wales in 1913 before enlisting with the 180 Brigade of the Royal Field Artillery, earning the position of Captain before he died from wounds sustained during the Battle of the Somme. Richard Waite Richardson was born on the 11th November 1881, the eldest son of George and E.E. Richardson of Kingston Upon Hull, Yorkshire. He was a Queen’s Scholar and entered the University College of North Wales in 1901. Upon graduating he took up a position as an assistant Schoolmaster before joining the 13th Battalion (North Wales) of the Royal Welsh Fusiliers at Wrexham. He was killed in action in France on the 11th July 1916 at Mametz Wood, the Somme. Howel Dilwyn Roberts was born on the 16th May 1897 in Brynteg, to Evan and Myfanwy Roberts of King Street, Wrexham. He was educated at the County School, Towyn, Merionethshire, before entering the University College of North Wales in 1915. He enlisted with the 14th (Service) Battalion of the Royal Welsh Fusiliers and was killed in action on the 31st October 1918 in France. 2nd Lieutenant Roberts was 21 years old. Hugh Owen Roberts was born on the 20th February 1890, the only son of Owen and Ann Roberts of Caegwyn, Llanfechell, Anglesey. He entered the University College of North Wales in 1909 and gained a BA degree in 1912. Hugh enlisted with the 12th Battalion of the Royal Welsh Fusiliers, serving with the Mediterranean Expeditionary Force as 2nd Lieutenant. He died on the 4th April 1922 at the Victoria Cottage Hospital, Abergavenny. Robert James Roberts was born in Penmynydd on the 10th July 1894 to John and Anne Roberts of Fferam Gorniog, Pentraeth, Anglesey. He was educated at the Llangefni County School before entering the University College of North Wales in 1911. Previous to enlisting with the 14th, attached to the 13th Battalion of the Cheshire Regiment, Robert was employed as the Assistant Manager of the Marquis of Anglesey’s Estate at Plas Newydd, Anglesey. He was killed in action on the 11th October 1916 in France. Robert is buried at the Courcelette British Cemetery, Picardie, France. Two of his brothers also served in the war: Herbert, the youngest brother, was held prisoner in Germany, whilst Joseph crossed from Canada and saw fighting in France. The eldest brother was Mr William Roberts, BSc, Principal of the Punjab Agricultural College, India. Victor Roberts was born on the 24th May 1897, the youngest son of Evan Morris Roberts and Anne Roberts of the Metropolitan Bank, Llangefni. Victor was educated at the Llangefni County School and entered the University College of North Wales in 1911. He received a commission with the Welsh Regiment whilst a student at the University in January 1916, and was promoted to 2nd Lieutenant in February 1917. Victor was reported missing on the 19th July 1917, after being seen going towards another officer who had fallen after being shot. His body was found shortly after and buried with the fallen officer he went to help (2nd Lieutenant Salmon) in the ground where they died fighting rather than relinquish their post. A service was held at Moriah Chapel, Llangefni, in memory of Lieutenant Roberts in August 1917. William Lloyd Roberts was born on the 10th February 1895 to David and Caroline Roberts of 8 Wexham Street, Beaumaris. He entered the University College of North Wales in 1914, interrupting his studies to join the 7th (Merioneth and Montgomery) Battalion (Territorial) of the Royal Welsh Fusiliers in 1915. Lieutenant Roberts was killed in action on the 6th November 1917 at Ruhweilfah Ridge near Beersheba, Palestine. Herbert Morton Robinson was born on the 10th January 1885 to William H. and Elizabeth Robinson of ‘London House,’ St. Asaph. He entered the University College of North Wales in 1907 before commencing his teaching career at various schools around the country: Belvedere in Kent, Nottingham and then Burton-upon-Trent. 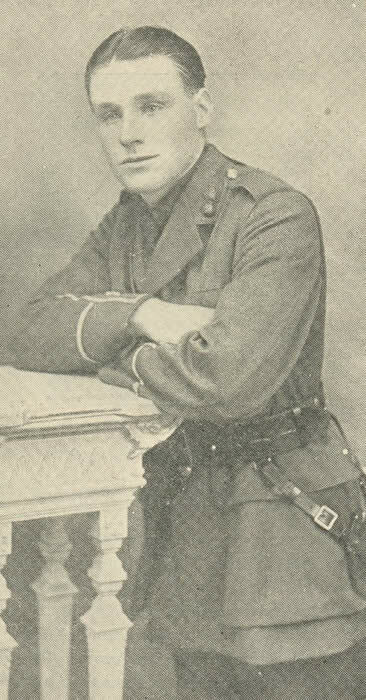 Herbert served with various regiments in his military career, enlisting initially with the Army Reserve in December 1915 and then being posted to the 12 Essex Regiment in March 1916, after which he was transferred to the 215th Suffolk Regiment in March 1916 and then finally he was transferred to the Wiltshire Regiment, Labour Corps (Agricultural Company). His student record states that he “Died as a result of the war” at the Sanitorium in Matlock on the 9th of February 1921. Noel Savage, as he was known, was the youngest son of Colonel Hugh Savage, VC, of Brynafon, Bangor, and Catherine Lucy Savage, born on the 26th December 1888. Noel was their second son killed in the war (his brother, John Frederick Savage, is also commemorated). He was educated at Ysgol Friars and the University College of North Wales, where he studied Electrical Engineering and subsequently took up a position as an electrical engineer on a large rubber plantation in British North Borneo. When war broke out, he came home and joined the Royal Anglesey Engineers as a 2nd Lieutenant, with which Regiment he went to France in May 1916, being afterwards transferred as a Lieutenant to No. 1 Foreways Company, Royal Engineers. He was hit by a shell during a dangerous mission and was killed instantly at Herrisart on 29 June 1916, aged 29. He is buried at Herissart Communal Cemetery. Llewelyn Shankland, born 1891, was the son of the Reverend Thomas Shankland, MA, and Mrs Shankland, Brynawelon, Bangor. He was educated at Friars School and Clynnog Fawr, later entering the University College of North Wales where he joined the Officers’ Training Corps when war broke out. In October 1914 he volunteered to join the army, and was commissed as 2nd Lieutenant in the North Wales Bantams, 19th Battalion Royal Welch Fusiliers. He went to France and was engaged in many fierce battles, was injured several times but was mortally wounded on 24 November 1917, dying on the 27th November 1917, aged 26. He is buried at Rocquigny-Equancourt Road British Cemetery, Manancourt, Somme. William John Sparling was born on the 17th October 1882 to Philip William and Fanny Sparling of ‘Holme-Nest,’ Runcton, Norfolk. He was born in Gloucestershire then registered at Erbistock. He entered the University College of North Wales in 1901. A homestead farmer by trade, he enlisted in the Canadian Expeditionary Force (CEF) on the 18th December 1914 in Winnipeg, Manitoba, Canada. 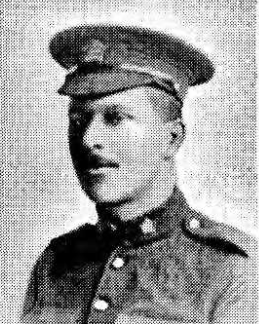 As a Private with the 8th Battalion of the Canadian Infantry (Manitoba Regiment), he was killed in action in Belgium on the 13th July 1915. His name is included on the Menin Gate Memorial, Ypres. The Sparlings lost three of their sons during the war. Robert Ronald Surtees was born on the 28th April 1892 to P.E. 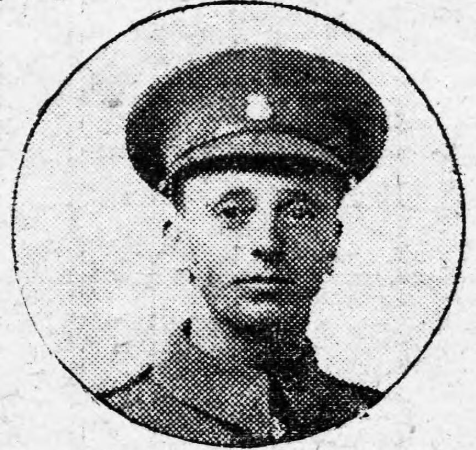 and L.A. Surtees of Consett, Co. Durham. He entered the University College of North Wales in 1912 and after graduating took up a teaching position at Richmond Hill School. He joined the Kings Company 1st Battalion of the Grenadier Guards (as a Guardsman) and was killed in action in France on the 10th September 1916. George Arthur Thomas was born on the 22nd November 1888 in Rhyl to Edward Clayton Thomas and Elizabeth Thomas. The family lived at Cybi Street, Holyhead, and later Park Street. He was educated at Holyhead County School before entering the University College of North Wales in 1907. Prior to joining the army he taught at Cybi School, Holyhead. He was a Private with ‘B’ Company, 16th Battalion of the Royal Welsh Fusiliers, formally the 13th (the Battalion was formed from recruits surplus to the 13th). George arrived in France with the Battalion in December 1915, moving towards the Somme. On the 6th January 1916 the Battalion moved to take up front line duties for the first time. On the 9th January the Battalion artillery shelled enemy wires – the enemy artillery retaliated, killing 2 men. George and his best friend from Holyhead, Lance Corporal John Henry Jones (they had joined the Battalion together), were both struck. Thomas John Thomas was born on the 22nd of November 1888, to Mr and Mrs John Thomas, 13 Crescent, Upper Bangor. He was educated at the National School, Upper Bangor, at Friars, and at the University College of North Wales where he obtained the degree of BSc in 1914. He was then appointed after competition, to a Mastership on the Naval Training ship “Impregnable.” While there he was promoted Supervisor on four of H.M. Ships. He joined the H.M.S. “Defence” two days before the Jutland Battle, which ship was lost with nine hundred lives. He was 26 years of age when he died on the 31st May 1916. [Additional Source: Cofeb y Dewrion : Heroes' memorial, 1914-1918]. William Henry Thomas was born on the 25th October 1880 to Lewis and Jane Thomas of Bryn Street, Newtown. He entered the University College of North Wales in 1903 and upon graduating took up a career in teaching. He taught at Penygloddfa School and was married to Agnes Florence Thomas with whom he had three children and resided at 25 Crescent Street, Newtown. He joined the Army Reserve in December 1915 and was posted to the Royal Garrison Artillery in June 1916. By April 1917 he had been promoted to the rank of Sergeant. On the 10th July 1917 he was badly wounded by a shell and died on the Western Front on the 12th July. He is buried at Coyde Mill Cemetery and is commemorated in St. David’s and Llanllwchaiarn Churches as well as the Crescent Chapel. Ben Gerald Noel Watkin was born on the 22nd April 1889, the second son of R.E. Watkin of Raven Inn, Flint. 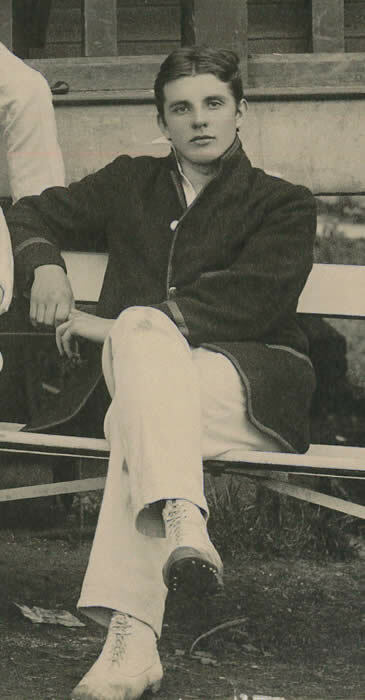 He was educated at Holywell School before entering the University College of North Wales in 1909, where he gained his colours in Cricket and Boating, and was a member of the Officers’ Training Corps. Upon leaving University in 1913 he took up a position at a commercial school in Greece (Professor of English). He was connected to the Bangor College Battery of Artillery and when the war broke out he returned to England and joined the 40th Battery of the Royal Field Artillery (43rd Brigade, 1st Division) and was given a commission. He was wounded by shrapnel bullet while in command of his section in the height of the action. He died from his injuries on the 27th January 1915. James Griffith Williams was born 1879, the eldest son of Evan and Eleanor Williams of 150 Anfield Road, Liverpool. He was married to Mary Jane Williams of Meiros, Llanharan. James was educated at Liverpool University and afterwards entered the service of the Liverpool Education Authority at the Anfield Road Schools. In September 1908 he was appointed lecturer in English at the Bangor Normal College. In 1914 he visited the schools of Belgium and Alsace to study the bilingual question and afterwards published a book entitled: “Mother Tongue ; Other Tongue, a Study in Bilingual Teaching.” James was in Southern Germany when the war broke out and narrowly escaped internment. After being attached for some time to the University College of North Wales Officers’ Training Corps he was appointed Lieutenant in the Royal Welsh Fusiliers, attached to the 17th Battalion, in 1915. He was killed in action in France on the 27th August 1918. Kelyth Pierce Lloyd Williams was born on the 10th August 1895, the only son of Dr W. Lloyd O. Williams, J.P., and Anne Lloyd Williams, ‘Cae'r Onnen,’ Upper Bangor (later Llanberis and Llwynybrain, Llanrug). Kelyth was educated at Towyn School and Shrewsbury School before entering the University College of North Wales in April 1914. Upon leaving Bangor he went to study medicine at Clare College, Cambridge. He joined the Officers’ Training Corps, and in early 1915 obtained his commission with the 17th Battalion Welsh Regiment. He was killed in action on the 17th October 1916 and was buried in the Marne British Cemetery, Grenay, France. He was 21 years of age. Lewys Jones Williams was born on the 18th June 1889 to Richard and Margaret Williams of ‘Fourcrosses House,’ Penrhos near Pwllheli. He received his secondary education at the County School, Pwllheli, where he displayed considerable academic ability - his aptitude for Art won him prizes in local eisteddfodau as well as the National Eisteddfod which was held at Caernarfon in 1906. Lewys entered the University College of North Wales, Bangor, in October 1909 where he studied for the degree of BA. He played a prominent part in the college’s social and athletic life: he was a member of the Students’ Representative Council, was Captain of the Boating Club, and also a member of the Officers’ Training Corps at the college. He was appointed deputy head of Tregarth Church School on the 1 October 1912 but left his duties at the school on 23 October 1914 to join the 10th Battalion Royal Welsh Fusiliers. On 17 December 1915 his battalion marched to the Belgian trenches, probably east of Ypres, where he was severely injured the following day. Four days later, Corporal Williams died of his wounds in a field hospital at Dickebusch. He was 26 years old. Lieutenant Peter Williams was born on the 24th January 1893 and was brought up by his grandfather, Mr Richard Jones, of 16 James Street, Bangor. He was educated at St. Paul’s School, Bangor, and at the County School, Bethesda, before entering the the University College of North Wales in 1913 to undertake a course of training in electrical engineering. As a student he was a member of the University Officers’ Training Corps and a prominent member of the Varsity Football Team. In 1915 he obtained an appointment with Messrs. British, Thompson and Houston, Electrical Engineers, based in Coventry, however it is unlikely he took up this position as in August of the same year he was given a commission in the 12th Battalion Royal Welsh Fusiliers. He was reported killed in action by the War Office in November 1916. Richard Williams was born on the 4th February 1891 to John M. and Margaret Williams of ‘Cefnfaes House,’ Carneddi Road, Bethesda. He entered the University College of North Wales in 1911 where he received a BA degree. He enlisted with the Royal Welsh Fusiliers and was killed in action on the 26th October 1916 at the Somme. He is also commemorated on the Thiepval Memorial. Richard Williams was born on the 2nd March 1894, the son of Richard and Jane Williams of ‘Clogwyn House,’ Harlech. He was educated at Barmouth County School and before enlisting with the army studied for a Science degree at the University College of North Wales in 1912. He enlisted as a Private early in September 1914 with the Royal Welsh Fusiliers, and by his ability was soon promoted quartermaster-sergeant and trained with his battalion at Aberystwyth and Bedford. His educational attainments marked him out for promotion and he obtained the King’s commission as 2nd Lieutenant and was posted to the Machine Gun Corps in July 1917. When the great German offensive commenced on the Western Front in early 1918 he was brought back to France and within a few weeks was severely wounded. A few days later, on the 2nd April, the news of his death in hospital from his wounds was conveyed by wire from the War Office. Thomas Glyn(ne) Williams was born on the 28th of September, 1883, the eldest son of Mr Thomas Williams, a coal dealer, and his wife Mary, 33 Greenfield Terrace, Bangor. He started his education at Friars School, Bangor, and entered the University College of North Wales in 1902 where he graduated with a BA Honours in French. Before joining the army he was a French Teacher in Moreton House School, Cardiff. He joined the 16th Battalion of the Royal Welsh Fusiliers as a Private and was killed in action in France on the 2nd of August 1917. Edmund Oswald Griffith Williams-Meyrick was born on the 8th August 1878, the son of the Rev. John Williams-Meyrick, Rector of Beaumaris (and former chaplain to Mr W.E. Gladstone), and Clara, of Bulkeley Place (later Menai View, Bangor). He was educated at Friar’s School, Bangor, before entering the University College of North Wales in 1897 (he also studied at Lampeter). He married Gwendoline Kate Dew in 1902 and they resided at ‘Withy Cottage,’ Abbotsbrook, Bourne End. He joined the 1st Garrison Battalion and died at Gibraltar on active service on the 7th May 1916. Lieutenant Winter, born on the 2nd August 1898, was the eldest son of Thomas Winter, M.A., for many years Professor of Agriculture at the University, and of Mrs. Winter, Newby Terrace, Deiniol Road, Bangor. He was educated at Friars School, Bangor, and at Giggleswich School, Yorkshire. In October 1913 he entered the University having obtained a Caernarvonshire Exhibition of £20. He joined the Royal Welsh Fusiliers in 1917, went to France on August 22nd 1917, and was killed near Albert on April 22, 1918, at the age of 19 years.